NYRA announced that handle was up 7.7 percent and attendance down 5.4 percent for the first 16 days of racing. An asterisk accompanied the attendance figure, noting that so far this summer there’s been one fewer giveaway – a promotion that swells the crowd considerably. 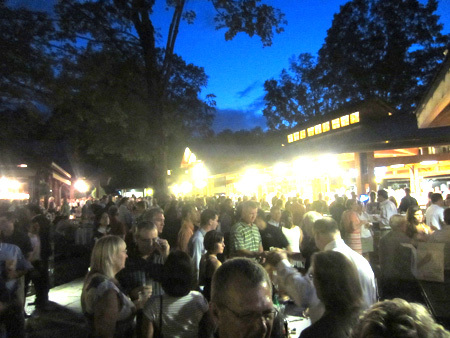 Caption: Nighttime at the Fasig-Tipton auction grounds came alive with a buzz that had buyers and horse racing fans excited. The Fasig-Tipton Company also reported an upswing in business, concluding its two-evening auction on George St. and East. The area around the racecourse seems a little less exciting now that it’s over; certainly, at least a little quieter. Intermittent rain kept gawkers on alert for the second night. But the first night was electric. Looking older and doughier, the Sheikh arrived ten minutes before the first gavel struck the block. He’s so seriously-faced that it’s hard to tell what he is thinking. Several consignors were thinking that if he stops coming and supporting the sale, the high cost of shipping up horses to sell might persuade many to remain in Kentucky. Now would be a great time to get into the horse business, even if only by joining one of the many partnerships available to small investors. You take baby steps – first a teeny share to whet your appetite, then a bigger slice, until finally you name your own horses, design your own silks and see your name in the program. Regarding the NYRA numbers, they are good but they don’t license the association to go whole hog with spending – unless, of course, it’s modeling itself after the Federal government. The NYRA Board meets Wednesday morning to hear a plan for the future. The plan will call for a sizable building initiative. At 7 pm, Paul Roberts, the British consultant who NYRA hired to confirm that it’s okay to change Saratoga in a way that it wanted to in the first place, will deliver a speech titled, The Spa: Saratoga’s Legendary Track, which happens, by the way, to be also the name of his book. He’ll be selling and signing books, too. Roberts told National Public Radio in a recent interview that changes are coming to the Carousel Restaurant and the old paddock building – the wooden structure that runs perpendicular to the Clubhouse and Restaurant Row. “The racecourse needs to accommodate all kinds of customers,” he said. At the races, it’s a modest card. Nevertheless, there’s a maiden two-year-olds special weights sprint, a $75,000 stakes race and a few high level claiming and allowance optional claiming contests planned. Yesterday, Uncle Mo had a five-furlong bullet work. Singer/songwriter Gavin DeGraw, who was mugged in New York after leaving a bar in the early morning, had to cancel his SPAC performance with Maroon 5 and Train. The concert, without him, still rocked. There were 76 speakers on stage. Eclipse Award winning writer Sean Clancy wrote a piece titled “Miles and Miles” about a father and son and horse racing in The Saratoga Special that Saratoga Diary readers would especially appreciate. 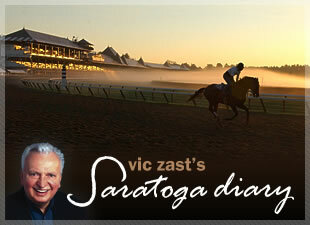 Vic Zast is the author of “The History and Art of 25 Travers.” Zast has attended the races at Saratoga for 48 straight summers.